Ever since Groundhog Day proved to be a huge hit, over the years there have been quite a few films that have ripped off that film’s basic premise of someone reliving the same day over and over again, from sci-fi thrillers like Source Code and Edge of Tomorrow, to super-sappy teen romances like this year’s little-seen Before I Fall (so little-seen, in fact, that it apparently came out back in July here in the UK and I only found out about that while researching for this review). There’s a reason this premise is repeated more than the day is in the movies, and it’s because it adds a huge amount of twisty fun to the mix, giving it a much-needed boost of energy to make it different from all of the other genre films like them. 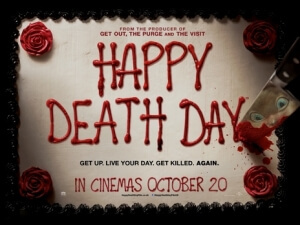 The latest example, slasher film Happy Death Day, is a strong example of how it can definitely make it feel more fun than the typical slasher movie, but also has a few other strong notes to it that would have made it work even without the gimmick. We first meet college student Theresa “Tree” Gelbman (Jessica Rothe) as she wakes up in the dorm bedroom of her classmate Carter (Israel Broussard), and as the day goes on we learn that she’s not the most pleasant person to be around, as she’s quite self-centred and rude to others around her. She leaves such a bad impression, it seems, that that night she is murdered by a hooded figure wearing the mask of the college’s baby mascot… and then finds herself right back where she started, in Carter’s bedroom. She slowly realises that she is reliving the same day over and over again right up to when she is killed, and sets out to discover her murderer’s identity before they can actually kill her again, and again, and again. There was a hint of trepidation with this film that it would just be an obnoxious and rather dumb slasher movie, partly because it comes to us from the director of Scouts Guide to the Zombie Apocalypse, but also because there was a fear that this Groundhog Day plot device might not exactly add tension or suspense to what it meant to be a horror film. Luckily, the film manages to overcome these hurdles by injecting itself with a self-aware attitude, which enables it to just have fun with its own premise instead of taking it incredibly seriously, and relieves itself of the pretence that this is meant to truly be the next Friday the 13th or Halloween and just exists as an amusing standalone. It’s not especially scary, but it kind of is in the same way that the Scream movies are scary, in that you can alternatively laugh and be a little startled by the ridiculous and over-the-top scares it provides; you’re more laughing along with it than at it, and for something that could easily have nixed the humorous angle altogether can make all the difference in the world. You also need a strong actor to carry this kind of movie the whole way through, someone who like Bill Murray or Tom Cruise is good at creating a well-rounded character even if they’re not the easiest to like in the first place, and Jessica Rothe is more than up for the task. The actress, who you may recall seeing in La La Land as one of Emma Stone’s roommates, delivers a star-making turn here in the same vein as Stone herself in Easy A, proving that she can handle funny, sad, serious, and downright terrified moments near flawlessly, and is endlessly watchable even in her bitchiest of scenes. The fact that this movie is already doing pretty well at the box office should ensure that more attention is brought to Rothe’s abilities, and that this is only the beginning for what promises to be a strong career if her great lead performance here is anything to go by. Though there are tons of things to like about this film, and it is certainly a very likable film – which is something nobody ever expected to say about a slasher film called Happy Death Day – it can’t help but feel somewhat neutered when it comes to being an actual slasher movie. For a film that centres around a person being brutally murdered by a masked assailant, it’s shockingly bloodless and clearly shot/edited to appeal to a slightly younger audience (unsurprisingly, this was released as a PG-13 in the States), which given that there are rarely any slasher films around anymore is not good news for anyone wanting a return to the gory days of Michael Myers or Jason Voorhees. It loses a little bit of its edge because of that, although the efforts of this fun screenplay and especially this fun lead performance by Jessica Rothe help sharpen some newer, if slightly safer, edges in its stead. It’s a fun movie that’s a breath of fresh air in the oversaturated horror market of ghosts and found-footage rubbish, and if fun is what you seek then I’d recommend you spend your time watching this over and over again. Happy Death Day is a fun slasher film that adopts a refreshingly self-aware and unpretentious attitude that, thanks to a star-making lead turn by Jessica Rothe, brings joy as well as a couple of scares to the proceedings.